Where the Aprilia Caponord 1200 gets its balance! The Caponord 1200 has been honed in countless sessions in the wind tunnel for maximum aerodynamic efficiency while ensuring crucial wind protection for both the rider and the passenger. Right from the start of the project, panniers were considered as an integral part of the whole design of the bike, while extensive ergonomics studies defined a relaxed, upright riding position, giving the rider a dominating view of the road while minimising fatigue during long journeys. As a result, the bike looks extremely compact even with the panniers fitted. With the same goals in mind, the layout of the frame and suspension has also been extensively revised, adapting the famously sporty frame of the Dorsoduro to every day use. This is a mixed structure frame, consisting of a high strength tubular steel trellis linked to a pair of die-cast aluminium plates. The frame was drastically revamped in order to find maximum stability at high speeds, maintaining handling which sets the bar for the segment. The lower saddle, now just 840 mm from the ground, also improves rideability. The superb drivetrain has also been substantially revised on both a hardware and a software level to prioritise comfort and fun. The Noale Engineering Division, the centre of technological excellence allowing Aprilia to secure 51 world championships in the world's most prestigious and selective racing series in just a few years, worked on the basis of the reliable Aprilia V-twin, already an example of highly advanced construction technology and the result of extensive studies to optimise internal fluid dynamics and improve combustion, reduce friction and maximise performance. 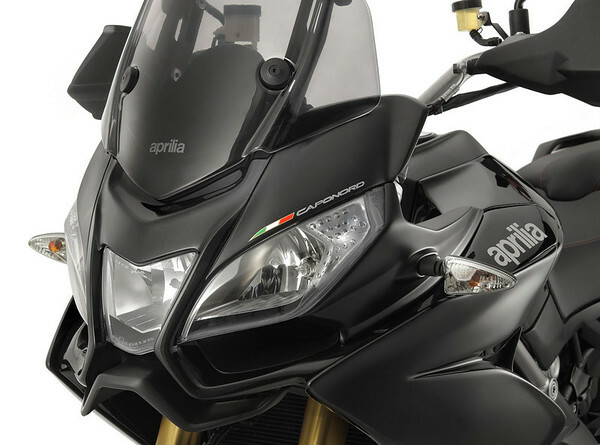 Aprilia's engineers further honed this unit to achieve even more progressive power delivery all the way from the bottom of the rev range and offer extraordinary riding pleasure, with even more generous torque than before. All of this has been achieved while actually reducing fuel consumption. A choice of dedicated accessories is also offered.